Check out our customers opinions on Dakine-Shop. 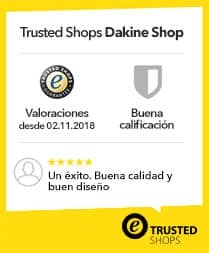 Feel free to search through the review websites that are listed below, to find further opinions and comments of more clients and Dakine shoppers. Receive a 5,00 € dakine-shop gift coupons for posting your opinion online! How does it work? Just sign up to one of the listed review websites and post your opinion. Afterwards please send us an e-mail containing the link to the comment you just postet: info@dakine-shop.com, subject: Shop Review. Make sure to enclose your entire name and customer ID. As soon as we could verify your data, we will send you the 5,00 € gift coupon (no minimum order value!). MUY BUENOS PRODUCTOS, SON DURADEROS Y BUENA RELACIÓN CALIDAD PRECIO. A ESPAÑA EL ENVIÓ TARDO 6 DÍAS, PERO BIEN. I just realized that I have the same Dakine backpack for 9 years and still using it! It is just weird..It is crazy and mindblowing that simple product like backpack can be used for so long, especially nowadays when everything is made to last enough just for this season. But not for Dakine, these guys went all in! And the price? If calculated - my backpack cost 5 euros a year. The service and the products are perfect! Thank you guys! I was happy with Dakine Shop, they have very good products at a fair price. The shipping was fast, I made my order two weeks ago and I had to return a backpack and they have already answered me and payed me back with no problems. I bought an outdoor backpack at the Dakine online shop. Delivery [to Germany] was fast and only took two weekdays. The backpack is of good quality. A special thank you to the friendly customer service, who helped me to solve a problem with a discount voucher code. Everything good - my parcel arrived yesterday and I had only ordered it on thursday. Delivery seems to be really fast! I will take my new Dakine backpack and gloves on a ski trip next week and am really looking forward to it :-) I will gladly order with Dakine shop again! High quality products: I ordered a Dakine Shop school set as a christmas present for my granddaughter. The school backpack arrived today and I was impressed by its quality. I also liked the possibility to choose from a lot of different colors. I didn't know Dakine as a brand before, but it currently seems to be the hippest brand for school products. I will gladly recommend the brand and the online shop and hope to surprise my granddaughter. Dakine online shop is a professional online retailer and perfectly adapts to its clients and their needs. The clearly arranged menu and categories on the website make it easy to place your order. They offer various payment options and delivery is really fast. The customer service helps answers your e-mails regarding retruns and cancellations within a few hours, and you quickly get your money back. The Dakine products are of high quality and style. I would totally recommend this online shop!